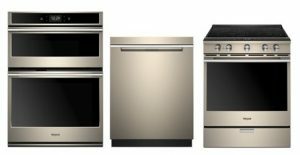 Every year at KBIS, and IBS major appliance manufacturers trot out their new appliances for the trade to see. Along with the latest versions of refrigerators, washers, dryers, cooktops, and ovens they often use these venues to preview future offerings. Let’s take a moment to consider what we can expect this year from the upcoming February show in Las Vegas. In 2019, appliance manufacturers are more likely to build on previous innovations than they are to make major new launches. Think of this as a year of consolidation of some of the big changes in the past few years. Haier is going to move forward with some initiatives that have been in the pipeline for a while as GE Appliances has now become fully integrated into the Haier Company. Haier is getting the GE brand family sorted out and in fact is gradually removing the GE name from some of the product assortments. The luxury brand Monogram has been just Monogram for a while, and now Cafe’ is moving forward to be with its Matte’ collection with no mention of the GE name. (See our blog re: Cafe’). Haier’s compact appliances are now being marketed as Haier by the same team that handles GE, GE Profile, Monogram, and Cafe’. New Colors and Finishes are not going away. GE’s Slate finish appears to be here for a while, though I don’t see anybody else adopting it. Black Stainless Steel is definitely making its mark throughout the industry. Whirlpool has launched a new color/finish called Sunset Bronze. It’s like a golden stainless steel. I like it a lot. Column refrigerator, freezer, and wine storage units were once the exclusive domain of European brands Thermador, Gaggenau, and Miele. Now column refrigerators have become a strength of Sub Zero, and more recently we see Jenn-Air, Dacor and others joining the fray. 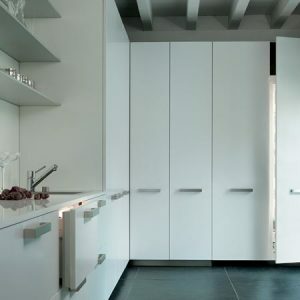 Column refrigeration units offer considerable flexibility in refrigerator, freezer, and wine storage, and when arrayed together along a kitchen wall are really striking. 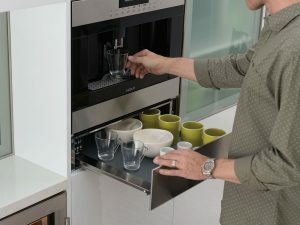 Built-In coffee machines have been one of the big hits of the past few years, and are no longer confined to the luxury brands. Look for them to continue their growth as built-in coffee makers are introduced by other premium appliance brands. While steam ovens are not growing as fast as the built-in coffee category, they have carved out a solid niche’ in the luxury brand space and continue to grow steadily. Perhaps the biggest trend in appliances is the rapid growth in connectivity. There is hardly a major brand out there that does not have at least one appliance that connects in some way through wi-fi or bluetooth. With connectivity, an appliance can be operated remotely, and upload or download data to an external device such as a smart phone, Alexa, or some electronic hub. 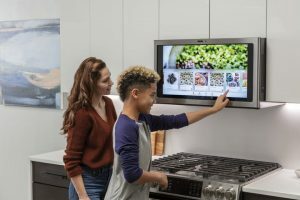 Give some credit to Samsung for helping popularize this concept with their Family Hub Refrigerator, while GE and Whirlpool have been talking about and showing prototypes of connected appliances for years. This past year GE (sorry, “Haier”) has been showing a range hood that doubles as a family hub (see photo below). Remember when GE introduced a range hood with a built-in microwave? Everybody, including me, laughed at the idea which has been one of the biggest new appliance launches of the last fifty years. I think GE/Haier is getting close to launching their kitchen hub later this year. That’s our sneak peak of new appliances that may be coming soon. For all your appliance needs or help with carpeting, tile, window treatments, water systems, and more be sure to contact the Arizona Wholesale location in your area today.